proud to be performing along with two other amazing artists (nathan mclaughlin, joe houpert) as part of the crow with no mouth 2012 concert series. i’ll be performing an improvised set using a pair of modified reel to reel tape machines and acoustic instruments. 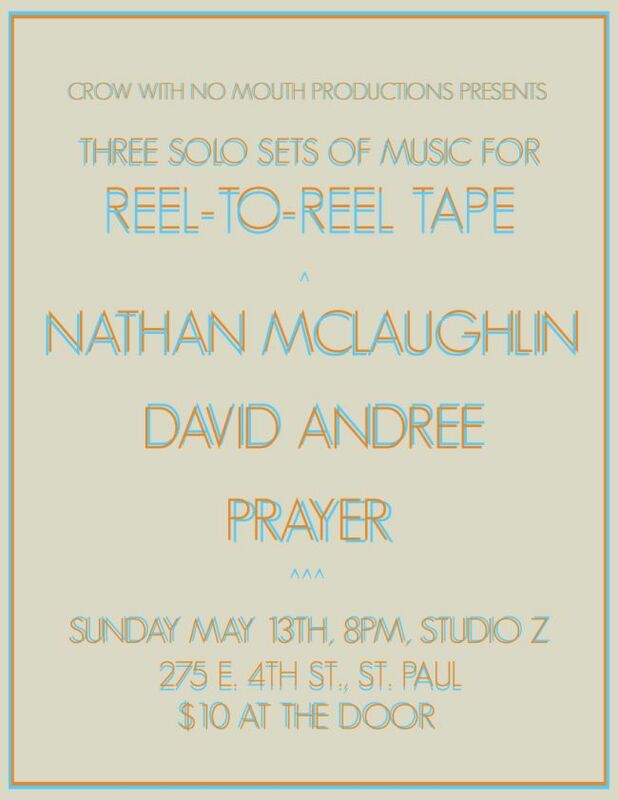 crow with no mouth promotions is pleased to present three musicians working with reel-to-reel tape in an evening of composed and improvised music. The first concert in the cwnm 2012 concert series brings together musicians who have focused for several years on using tape as a source of unabashedly beautiful sound; at times highly abstract, at others narrative-driven, Andree, Prayer and McLaughlin extend the tradition of tape collage, concrète, and intelligent ambient music. Poster by artist, musician and swell human being Jaron Childs. condition: (as determined by the thirteenth junto project) create something new by using only a recording of wild up performing chamber symphony, op. 110a, by dimitri shostakovich. duration should be between two and seven minutes. process: original recordings processed through effect pedals, looped live to closed tape loops and recorded down to 4-track open reel tape in three passes.